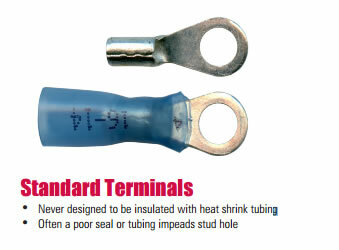 Our heat shrink connectors provide durable long lasting electrical connections. Each wire terminal is lined with a polyolefin adhesive glue so that when crimped onto the wire ends and heated the terminal is completely sealed against air and water. 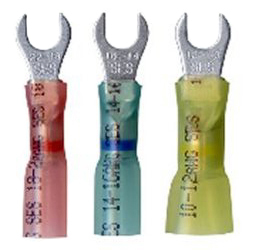 In addition to providing a waterproof connection and protecting against corrosion heat shrink crimp connectors form more durable connections providing greater pull strength than vinyl or nylon wire connectors. 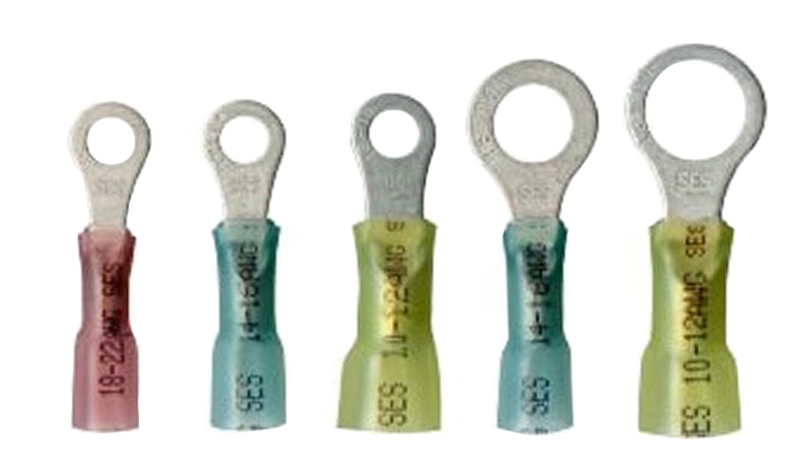 Our Sealed Crimp Connector product line is the finest line of “crimp-and-seal” connectors on the market today. New design features, the use of only the finest components, and an expanded product selection place Sealed Crimp Connectors squarely at the top of the class. - Long neck ring insulated with heat shrink tubing. 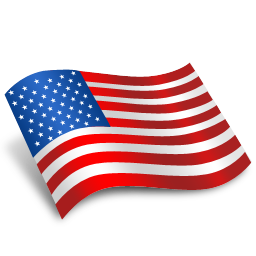 - Long neck ensures proper seal and that the stud hole isn't blocked by the tubing. - The longer neck allows the barrel of these ring tongue connectors to come together at a 45° angle leaving enough room for visual inspection of the wire and ensuring that the wire can be stripped to the correct length. 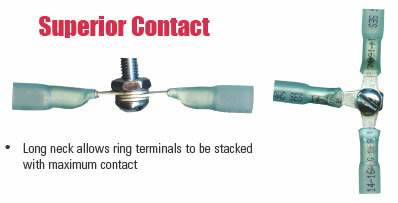 - The tubing doesn't get in the way when stacking long neck terminals so there is better contact. 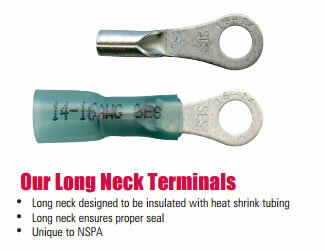 Heat Shrink Long Neck Ring Terminal - Click on Price to purchase.